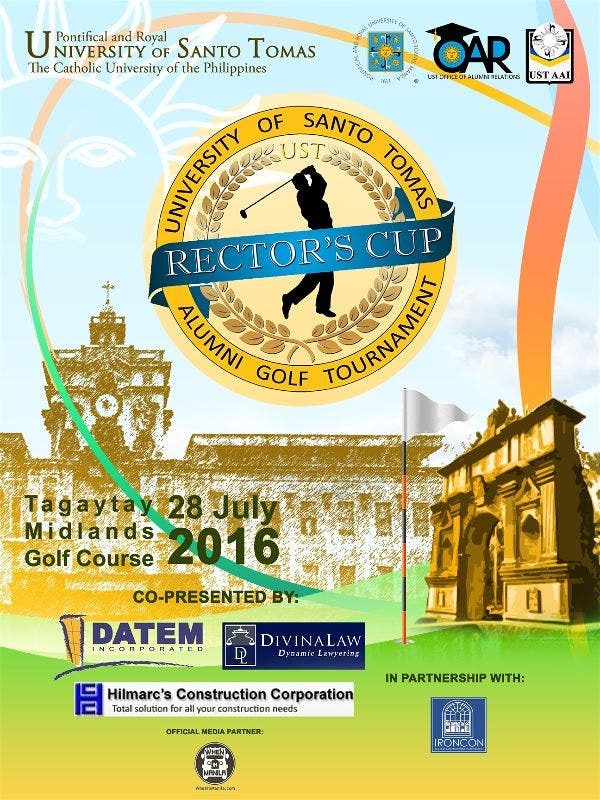 The 1st University of Santo Tomas Rector’s Cup Golf Tournament is here! Earmarked for raising funds to support the Thomasian athletes who will be representing UST in the upcoming UAAP Season 79, the very first Rector’s Cup Alumni Golf Tournament will be held on July 28, 2016 at the Tagaytay Midlands Golf and Country Club. Through the collaborative work of the University of Santo Tomas, UST Office of Alumni Relations, and the UST Alumni Association, Inc. the golf tournament is set to include valuable prizes, namely Ramon Orlina trophies for the individual and team over-all champion, UST Framed Photographs by Paul Quiambao, a Michael Leyva Creation, a Wilfredo Layug sculpture, Blanco Brothers’ Paintings, and many more artworks and products of Thomasian artists to be given away as raffle prize. The tournament is open to all Thomasian alumni and friends. Tournament fee is Php 5000 which includes the green fee, caddie fee, golf cart, lunch, giveaways and raffle prizes among other things. Registration is until July 11, 2016. For registration and sponsorship inquiries, we may get in touch with Jaika Corpuz via mobile number 09399275174/09156345896 or via email address eventsustalumnirelations@­gmail.com.